Evaluation of bio-efficacy performance of NATMOS natural insect repellent spray against Aedes aegypti mosquitoes. 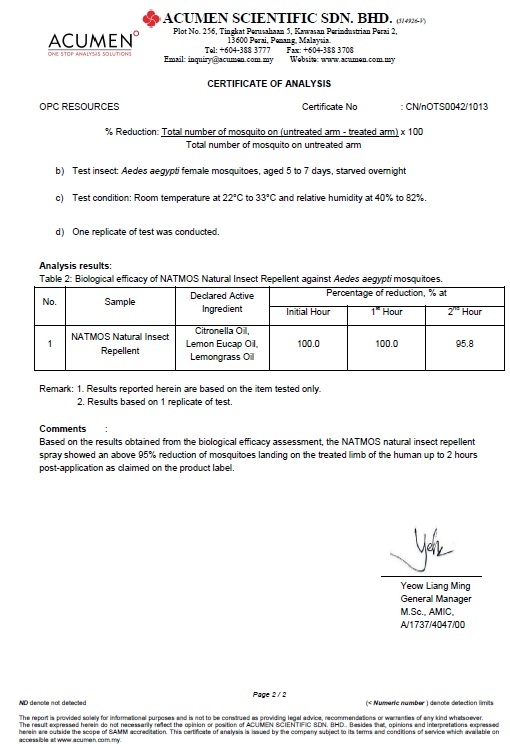 Based on the results obtained from the biological efficacy assessment, the NATMOS natural insect repellent spray showed an above 95% reduction of mosquitoes landing on the treated limb of the human up to 2 hours post-application as claimed on the product label. Determination of Cadmium, Lead, Mercury, Hexavalent Chromium, Polybrominated Biphenyls (PBBs) and Polybrominated Diphenyl Ethers (PBDEs) in accordance with EU Directive 2011/65/EU (RoHS). The test is carried out in challenging sample of "NATMOS Anti Mosquitoes Spray” with a prescribed initial inoculums of microorganism and the surviving number of microorganism are determined at zero(immediately), one(1) and two(2) minutes contact time intervals. The test is carried out in challenging sample of "REMOS Anti Mosquitoes Spray” with a prescribed initial inoculums of microorganism and the surviving number of microorganism are determined at zero(immediately), one(1) and two(2) minutes contact time intervals.